Welcome to Jakarta VW Campervan, the first & the only Volkswagen classic campervan rental company in Indonesia. Selamat datang di Jakarta VW Campervan, tempat penyewaan (rental) mobil Volkswagen Campervan klasik pertama & satu-satunya di Indonesia. VW Campervan is the most famous campervan in the world. They pioneered the campervan world as we know it today back in the 1950’s. The combination of a compact van equipped with all the basics of your home was & still is the most practical combination to explore the world far beyond the imaginary fence of your home. The words freedom & adventure are what to describe these vans. And now, they are here in Indonesia & available for rental, for yourself or with your family, friends & loved ones, for a weekend camping or simply a day trip picnic outside the town. VW Campervan adalah kendaraan campervan yang paling terkenal sedunia. VW memelopori jenis kendaraan yang sekarang disebut campervan ini di tahun 1950-an. Kendaraan jenis ini sangat populer karena Anda dapat membawa rumah secara praktis untuk dibawa jalan-jalan keluar. Bebas menjelajah adalah dua kata yang sangat jelas mendefinisikannya. Sekarang, campervan ini telah hadir di Indonesia & tersedia untuk disewa untuk Anda sendiri, atau untuk mengajak sekeluarga camping di akhir pekan atau piknik keluar kota, bersama teman atau siapa saja yang Anda cintai. Jakarta VW Campervan is a family-run business. Sitting proudly in the driver’s seat is Doddy, the owner, a Volkswagen enthusiast & a classic rock lover. We pride ourselves on our hire vans being of the best quality, providing comfort, reliability & that all important classic style. Jakarta VW Campervan adalah usaha keluarga yang disupiri oleh Doddy, sang pemilik, seorang penggemar VW & juga seorang pecinta musik rock klasik. Kami merasa bangga bahwa semua kendaraan kami berkualitas tinggi, nyaman, handal & bercita rasa klasik. We’re based in south of Jakarta, within easy reach from Pasar Minggu exit of JORR toll road & is only 10 minutes walk from Tanjung Barat train station. 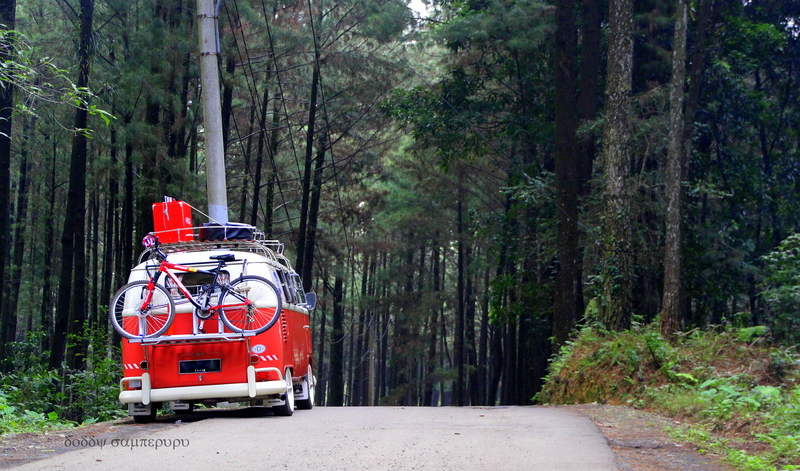 To reach us, please call at +62 813 1031 4210, or email us at vwcampervan.jakarta@yahoo.co.id. We recommend you to read the FAQs, as well. Kami berlokasi di Jakarta Selatan, dekat pintu keluar Pasar Minggu di jalan tol JORR & hanya berjarak 10 menit jalan kaki dari stasiun Commuter Line Tanjung Barat. Untuk menghubungi kami, silahkan telepon di nomor +62 813 1031 4210 atau lewat imel vwcampervan.jakarta@yahoo.co.id. Kami juga menyarankan Anda untuk membaca FAQ terlebih dahulu untuk mendapatkan banyak informasi lainnya.. The rental prices is available here. Tarif sewa dapat dilihat disini. Please call +62 813 1031 4210 for booking. Mohon telepon kami di nomor +62 813 1031 4210 untuk pemesanan. Hope you visit us soon. Legendary rock band Queen has been inspiring millions since their London formation in 1970. With the charismatic, musical genius front man born Farrokh Bulsara — aka Freddie Mercury — (Lead vocals, piano), Brian May (Vocals, Guitar), John Deacon (Vocals, Bass) and Drummer Roger Taylor (Vocals, Drums). Queen has represented musical vision and freedom through their pioneering and creative approaches to composition and poetic, on-point song lyrics. The band continues to earn new fans of all ages and backgrounds 48 years after their initial formation. It has been a Bohemian Rhapsody fever here in this country. As a fans of Queen myself, since 1982, I’m posting these photos of our 1963 VW Beetle accompanied by quotes taken from Queen’s songs, lyrics or a comment. Is this the real life? Or this is just fantasy? (The first lyrics from song Bohemian Rhapsody, album: A Night at the Opera, 1975). (A lyrics from song Somebody to Love, album A Day at the Races, 1976). (A lyrics from song Life is Real (Song for Lennon), album: Hot Space, 1982, written by Freddie as dedication to John Lennon’s death). (A lyrics from song Fat Bottomed Girls, album Jazz, 1978). (A lyrics from song Don’t Stop Me Now, album Jazz, 1978). ‘She’s a Killer Queen. Gunpowder, gelatin, Dynamite with a laser beam. (A lyrics from song Killer Queen, album Sheer Heart Attack, 1974). He is the Hitman, the great pretender, Mr. Bad Guy, just a poor boy, the invisible man. (A lyrics from song Las Palabras de Amor, album Hot Space, 1982). (A lyrics from song I Want to Break Free, album The Works, 1984). (Album: A Kind of Magic, 1986). (A lyrics from song Spread Your Wings, album News of the World, 1977). “I used to take a nap in a van & listen to Queen. Over & over again, & drained the battery in the van. Than we’d be stuck. That happened a few times. If you are interested to rent this classic Volkswagen Beetle for any events, please call us at +62 813 1031 4210. 30 interesting facts about Volkswagen in infographic. Two weeks ago, during the fasting month of Ramadhan, my friend & I went for a camping at Ciapus area, Bogor, about 65km away from Jakarta. This time, we drove our Volkswagen 1303 Super Beetle. I was by myself & my friend brought his 3.5yo daughter & 6.5yo all-black German Shepherd. Other good thing is, due to fasting month, there was only us in the camping ground; 3 humans & 1 dog. Felt like our own personal camping ground. We were also allowed to drive our cars & parked them inside the camping ground. On normal days, the cars are parked outside the camping ground. The toilets (squat type) & bathrooms are available with clean running water, spring water. The toilet is lit at night. Also, places for wudhu or washing your dishes are located in the same area, about 50m away from our tents. Actually some shops are available there but all of them were closed during Ramadhan. When they are open, instant noodles, snacks & hot-cold drinks are available. Rice & heavy dishes only available upon request. There is a pool on the nearby river where we can swim safely. The spring water is clean, clear & fresh. The size is about 10m x 10m. The deepest part is 150cm with rocks on the pool floor. The location is about 100m from our tents. The name of the place is purposely not written here to maintain the ‘privacy’. Please contact us directly if you are interested to visit it. The view from my weekend motel. If you are interested to rent this classic Volkswagen 1303 Super Beetle for any events, please call us at +62 813 1031 4210. The gallery has two stories. The RWB custom Porsche are displayed on ground floor. The rare classic vintage VW & Porsche are displayed on the basement. There are five Porsche on the ground floor; four are RWB custom & one is standard. The aluminium roof is designed & manufactured by Terror Garage, claimed to be the one & only in the world. The RWB rear wing: tall & complex aerodynamic design but beautiful. A very well built Volkswagen Type 14 Karmann-Ghia. There are two of them here. A very rare Volkswagen Type 2 Deluxe Microbus aka Samba with 23-windows & original two-tone factory paint design. The 2nd VW bus is the early version of the T1 (untill 1955) aka Barndoor or T1a. The only Porsche displayed here is Porsche 356, the Porsche’s first production automobile (1948-1965), therefore it’s one of the most hunted by Porsche collectors in the world. This particular one is the Porsche 1500S (1500cc engine, Luxury version). Get your calculator & start estimating the value of these six piece of fine German metals. One high-value property is this Tempo Matador, the only one available in the country. Tempo Matador is built by Tempo company in German using a front mounted 25HP Volkswagen 1100cc motor & front wheel drive. The 3rd Type 14 Karmann-Ghia, slammed & narrowed, custom-built by Terror Garage themselves. A custom Beetle built by Terror Garage. A Barndoor ambulance in rat style. Unfortunately the gallery is not open for public. Nevertheless, the owner of Terror Garage welcomes for any VW clubs or communities to visit by appointment. Jakarta VW Campervan wishing you a Merry Christmas & a Happy New Year 2017. May you have the sweetest, marvelous, wonderful, successful & great year ahead. Auto Bild is a leading German automobile magazine based in Hamburg, Germany. Auto Bild was first published in the last week of February 1986. Auto Bild with its worldwide licensed editions, of which more than 7 million copies are sold every month, is published in 36 countries, including Indonesia. In June 2016, Auto Bild Indonesia published a special holiday edition (in Indonesian language: Edisi Spesial Liburan) with Jakarta VW Campervan as one of the main features. The VW Campervans picture is on the cover page. The centerfold of the magazine. The title says: “Traveling in Hippies Style”. You know what it means, don’t you? The interview & photo session were taken at a park in our complex, South Jakarta. Now, the park is gone & mall-office-apartment-hotel facility is being constructed there. Please call us at +62 813 1031 4210 for more information.